Dubai, UAE, 20 February 2018: For the first time in Rafic Al Hariri International Airport’s history, Emirates will operate a special one-off A380 service to Beirut on 29 March. 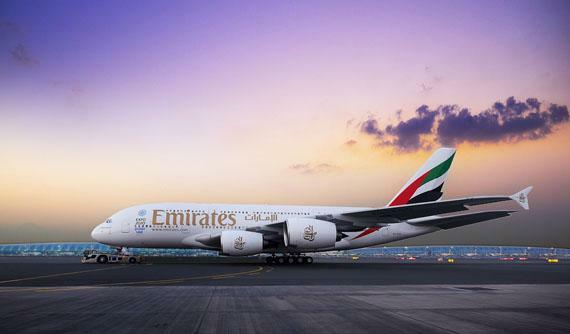 The airline’s flagship double-decker will become the first-ever scheduled A380 service to Beirut, and Emirates is working with the airport to test the operations and necessary infrastructure to accommodate an A380 service. The Emirates A380 service will operate as EK 957 and EK 958, departing Dubai at 0725hrs and arriving in Beirut at 1030hrs. The flight will depart Beirut at 1415hrs arriving in Dubai at 1905hrs on the same day. Sheikh Majid Al Mualla, Divisional Senior Vice President Commercial Operations, Centre said: “We are proud to fly our A380 for a one-off test service to Beirut, which continues to be an important destination for us in the region. Bringing this popular aircraft to Lebanon represents a significant milestone in our operations to Beirut after 27 years of serving the country. This year also marks the Emirates A380’s 10th anniversary since joining our fleet, and the iconic aircraft has brought flying to the next level for over 90 million customers. The upcoming service next month will give travellers the chance to experience this revolutionary aircraft and the best service in the sky. The air transport sector makes a major contribution to Lebanon’s economy, and its far-reaching impact to other industries serves as a catalyst for a spectrum of economic activity. According to a 2014 Oxford Economics report supported by The International Air Transport Association (IATA), the air transport industry and foreign tourists arriving by air are estimated to contribute to 12 percent of the country’s GDP. In addition, over 170,000 jobs in Lebanon are supported by the air transport industry through direct, indirect, subsequent supply chain and tourism activities. Investments in Lebanon’s aviation infrastructure such as the facilitation for A380 operations at Rafic Al Hariri International Airport will expand and improve its passenger and traffic handling capacity and accommodate for future growth. Since 1991, when the first service to Beirut was inaugurated, close to 5 million passengers have flown on Emirates. The airline started operating between Dubai and Beirut with a three times weekly service utilising a Boeing 727. Since then, Emirates has developed its services based on growing passenger demand and currently offers three daily flights to Beirut utilising a mix of Boeing 777 aircraft, connecting travellers to destinations across the Far East, Southeast Asia and Africa via its Dubai hub. Since 2015, Emirates has also transported over 54,000 tons of cargo to and from the country, supporting businesses and exporters. Main commodities exported from Lebanon bound for the UAE and beyond to the Emirates network include fresh and frozen fruits and vegetables. The Emirates A380 flying to Beirut will be set in a three-class configuration, with 429 seats in Economy Class on the lower deck, 76 flat-bed seats in Business Class and 14 First Class Private Suites on the upper deck. Once the A380 reaches cruising altitude, passengers in the First Class cabin can enjoy one of two on-board Shower Spas before joining fellow premium class travellers in the On Board Lounge where they can socialise, network and enjoy complimentary beverages, canapés and other special delicacies at 40,000 feet. Passengers in all classes will enjoy Emirates’ multi award-winning ‘ice’ Digital Widescreen entertainment system, offering over almost 3,000 channels of on-demand entertainment. The largest selection of programming in the sky includes a robust selection of over 300 Arabic movies, shows, music and other programming. Emirates currently has 101 A380s in service and 61 pending delivery, more than any airline globally. The airline also recently announced a US$ 16 billion (AED 58.7 billion) deal for 36 additional Airbus A380 aircraft. Emirates currently operates the A380 to 48 global destinations.